In the summer of 1988, wind-driven flames like those shown in the background photo swept through Yellowstone National Park, scorching nearly a million acres. 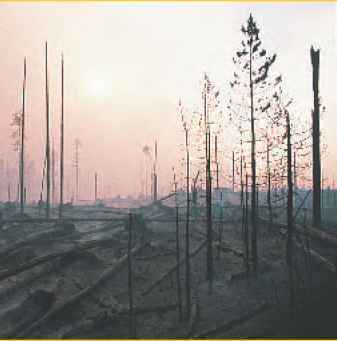 The Yellowstone fire was one of the largest forest fires in United States history. The images on this page show secondary succession— the process of ecological regeneration—triggered by the fire. ► After the fire, burned timber and blackened soil seemed to be all that remained. However, the fire didn't destroy the seeds that were protected under the soil. Wittyji\.weeks, grasses and other plants were beginning to grow in the burned areas. Ecological succession was underway. ► Many burned areas in the park opened new plots for stands of trees. This picture shows young lodgepole pines in August 1999. The forest habitat of America's oldest national park is being restored gradually through secondary succession. 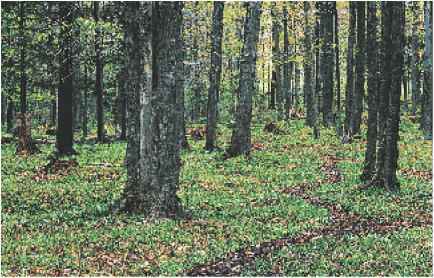 Figure 4 This beech-maple forest is an example of a climax community. Climax Communities A community of plants that is relatively stable and undisturbed and has reached an end stage of succession is called a climax community. The beech-maple forest shown in Figure 4 is an example of a community that has reached the end of succession. New trees grow when larger, older trees die. The individual trees change, but the species remain stable. There are fewer changes of species in a climax community over time, as long as the community isn't disturbed by wildfire, avalanche, or human activities. Primary succession begins in areas with no previous vegetation. It can take hundreds or even thousands of years to develop into a climax community. Secondary succession is usually a shorter process, but it still can take a century or more. 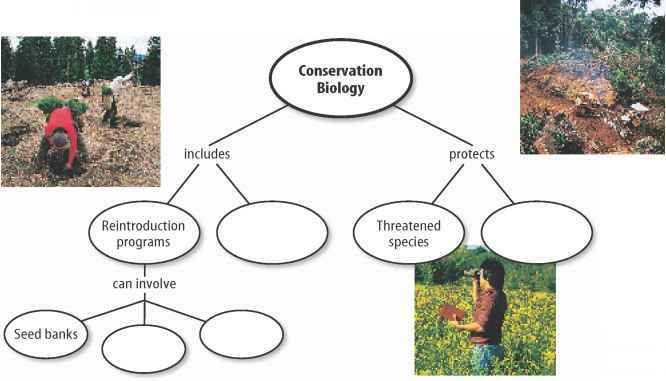 • Succession is the natural, gradual changes over time of species in a community. • Primary succession occurs in areas that previ ously were without soil or plants. • Secondary succession occurs in areas where soil has been disturbed. • Climax communities have reached an end stage of succession and are stable. • Climax communities have less diversity than communities in mid-succession. 1. Compare primary and secondary succession. 2. Describe adaptations of pioneer species. 3. Infer the kind of succession that will take place on an abandoned, unpaved country road. 4. Think Critically Show the sequence of events in primary succession. Include the term climax community. 5. Solve One-Step Equations A tombstone etched with 1802 as the date of death has a lichen on it that is 6 cm in diameter. If the lichen began growing in 1802, calculate its average yearly rate of growth. ■ Explain how climate influences land environments. ■ Identify seven biomes of Earth. ■ Describe the adaptations of organisms found in each biome. Resources that you need to survive are found in a variety of biomes. Does a desert in Arizona have anything in common with a desert in Africa? Both have heat, little rain, poor soil, water-conserving plants with thorns, and lizards. 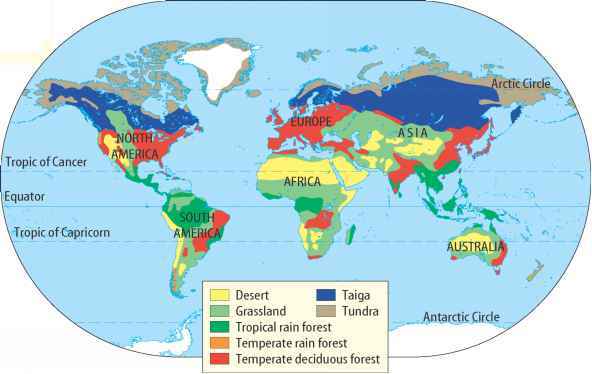 Even widely separated regions of the world can have similar biomes because they have similar climates. Climate is the average weather pattern in an area over a long period of time. The two most important climatic factors that affect life in an area are temperature and precipitation. Large geographic areas that have similar climates and ecosystems are called biomes (BI ohmz). Seven common types of land biomes are mapped in Figure 5. Areas with similar climates produce similar climax communities. Tropical rain forests are climax communities found near the equator, where temperatures are warm and rainfall is plentiful. Coniferous forests grow where winter temperatures are cold and rainfall is moderate. Figure 5 The land portion of Earth can be divided into seven biomes. Tundra At latitudes just south of the north pole or at high elevations, a biome can be found that receives little precipitation but is covered with ice most of the year. The tundra is a cold, dry, treeless region, sometimes called a cold desert. Precipitation averages less than 25 cm per year. Winters in the Arctic can be six to nine months long. For some of these months, the Sun never appears above the horizon and it is dark 24 hours a day. The average daily temperature is about -12°C. For a few days during the short, cold summer, the Sun is always visible. Only the top portion of soil thaws in the summer. Below the thawed surface is a layer of permanently frozen soil called permafrost, shown in Figure 6. Alpine tundra, found above the treeline on high mountains, have similar climates. Tundra soil has few nutrients because the cold temperatures slow the process of decomposition. Tundra Life Tundra plants are adapted to drought and cold. They include mosses, grasses, and small shrubs, as seen in Figure 7. Many lichens grow on the tundra. During the summer, mosquitoes, blackflies, and other biting insects fill the air. Migratory birds such as ducks, geese, shorebirds, and songbirds nest on the Arctic tundra during the summer. Other inhabitants include hawks, snowy owls, and willow grouse. Mice, voles, lemmings, arctic hares, caribou, reindeer, and musk oxen also are found there. People are concerned about overgrazing by animals on the tundra. Fences, roads, and pipelines have disrupted the migratory routes of some animals and forced them to stay in a limited area. Because the growing season is so short, plants and other vegetation can take decades to recover from damage. 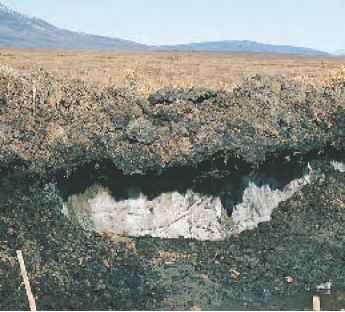 Figure 6 This permafrost in Alaska is covered by soil that freezes in the winter and thaws in the summer. Infer what types of problems this might cause for people living in this area. Figure 7 Lichens, mosses, grasses, and small shrubs thrive on the tundra. Ptarmigan also live on the tundra. In winter, their feathers turn white. Extra feathers on their feet keep them warm and prevent them from sinking into the snow. onA/isuals Unlimited, (bl)Pat O'Hara/DRK Photo, (br)Erwin & Peggy Bauer/Tom Stack & Assoc. Figure 8 The taiga is dominated by cone-bearing trees. The lynx, a mammal adapted to life in the taiga, has broad, heavily furred feet that act like snowshoes to prevent it from sinking in the snow. 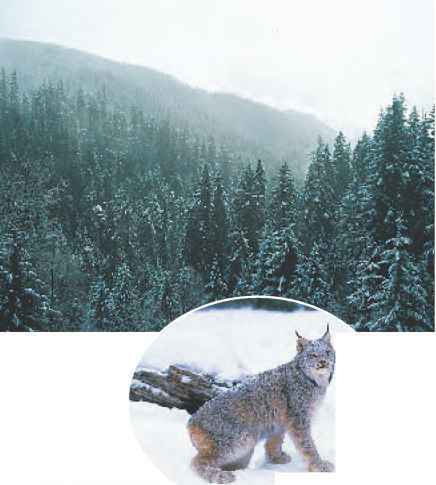 Infer why "snowshoe feet"are important for a lynx. Taiga South of the tundra—between latitudes 50°N and 60°N and stretching across North America, northern Europe, and Asia—is the world's largest biome. The taiga (TI guh), shown in Figure 8, is a cold, forest region dominated by cone-bearing evergreen trees. Although the winter is long and cold, the taiga is warmer and wetter than the tundra. Precipitation is mostly snow and averages 35 cm to 100 cm each year. Most soils of the taiga thaw completely during the summer, making it possible for trees to grow. However, permafrost is present in the extreme northern regions of the taiga. The forests of the taiga might be so dense that little sunlight penetrates the trees to reach the forest floor. However, some lichens and mosses do grow on the forest floor. Moose, lynx, shrews, bears, and foxes are some of the animals that live in the taiga. Temperate Deciduous Forest Temperate regions usually have four distinct seasons each year. Annual precipitation ranges from about 75 cm to 150 cm and is distributed throughout the year. Temperatures range from below freezing during the winter to 30°C or more during the warmest days of summer. Figure 9 White-tailed deer are one of many species that you can find in a deciduous forest. In autumn, the leaves on deciduous trees change color and fall to the ground. Temperate Forest Life Many evergreen trees grow in the temperate regions of the world. However, most of the temperate forests in Europe and North America are dominated by climax communities of deciduous trees, which lose their leaves every autumn. 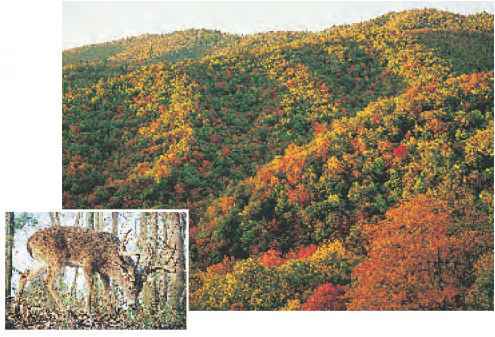 These forests, like the one in Figure 9, are called temperate deciduous forests. In the United States, most of them are located east of the Mississippi River. When European settlers first came to America, they cut trees to create farmland and to supply wood. As forests were cut, organisms lost their habitats. When agriculture shifted from the eastern to the midwestern and western states, secondary succession began, and trees eventually returned to some areas. Now, nearly as many trees grow in the New England states as did before the American Revolutionary War. Many trees are located in smaller patches. Yet, the recovery of large forests such as those in the Adirondack Mountains in New York State shows the result of secondary succession. Temperate Rain Forest New Zealand, southern Chile, and the Pacific Northwest of the United States are some of the places where temperate rain forests, shown in Figure 10, are found. The average temperature of a temperate rain forest ranges from 9°C to 12°C. Precipitation ranges from 200 cm to 400 cm per year. Trees with needlelike leaves dominate these forests, including the Douglas fir, western red cedar, and spruce. Many grow to great heights. Animals of the temperate rain forest include the black bear, cougar, bobcat, northern spotted owl, and marbled murrelet. Many species of amphibians also inhabit the temperate rain forest, including salamanders. The logging industry in the Northwest provides jobs for many people. However, it also removes large parts of the temperate rain forest and destroys the habitat of many organisms. Many logging companies now are required to replant trees to replace the ones they cut down. Also, some rain forest areas are protected as national parks and forests. 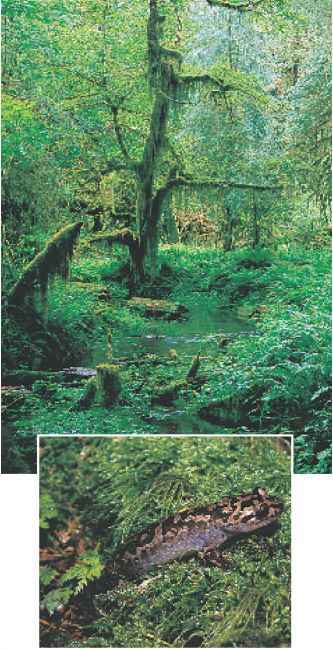 Figure 10 In the Olympic rain forest in Washington State, mosses and lichens blanket the ground and hang from the trees. Wet areas are perfect habitats for amphibians like the Pacific giant salamander above. Figure 11 Tropical rain forests are lush environments that contain such a large variety of species that many have not been discovered. 1. Draw an oval leaf about 10 cm long on a piece of poster board. Cut it out. 2. Draw a second leaf the same size but make one end pointed. This is called a drip tip. Cut this leaf out. 3. Hold your hands palm-side up over a sink and have someone lay a leaf on each one. Point the drip tip away from you. Tilt your hands down but do not allow the leaves to fall off. 4. Have someone gently spray water on the leaves and observe what happens. 1. From which leaf does water drain faster? 2. Infer why it is an advantage for a leaf to get rid of water quickly in a rain forest. Tropical Rain Forest Warm temperatures, wet weather, and lush plant growth are found in tropical rain forests. These forests are warm because they are near the equator. The average temperature, about 25°C, doesn't vary much between night and day. Most tropical rain forests receive at least 200 cm of rain annually. Some receive as much as 600 cm of rain each year. Tropical rain forests, like the one in Figure 11, are home to an astonishing variety of organisms. They are one of the most biologically diverse places in the world. For example, one tree in a South American rain forest might contain more species of ants than exist in all of the British Isles. Tropical Rain Forest Life Different animals and plants live in different parts of the rain forest. Scientists divide the rain forest into zones based on the types of plants and animals that live there, just as a library separates books about different topics onto separate shelves. The zones include: forest floor, understory, canopy, and emergents, as shown in Figure 12. These zones often blend together, but their existence provide different habitats for many diverse organisms to live in the tropical rain forest. fyi^lJ^IlJtiljmSL^ What are the four zones of a tropical rain forest? Although tropical rain forests support a huge variety of organisms, the soil of the rain forest contains few nutrients. Over the years, nutrients have been washed out of the soil by rain. On the forest floor, decomposers immediately break down organic matter, making nutrients available to the plants again. What kind of succession will take place on an abandoned unpaved country road? What kind of succession would occur on an abandoned unpaved country road? How much sunlightpenetrates through the trees? Where is tundra biome located?